Palm trees are not quiet. As they wave in the light wind, the palms clatter like a busy typewriter. For those of us who grew up in colder climates, palm trees are symbolic. Originally an (upstate) New Yorker, palm trees were a bit of a mysterious sight for me as a youth. We would travel to North and South Carolina in the summers for a family beach vacation, but rarely made further south to witness the waving beauties. Now I live in Colorado which is a stunning place to live. Colorado is a high desert however. It is very brown most of the year. Most of the green is the result only of copious amounts of water that are used to get grass, trees, and shrubs to grow in the desert. 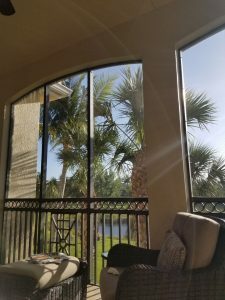 As I write this, I sit on the lanai with the palms waving at me. They are green and towering. They are a welcome sight after a long winter in Colorado. To my they are a symbol of warmth, vacation, and a bit of escape. In the evenings they are silhouetted against the colorful sunset. I wonder if I would ever tire of seeing them. Their biblical symbolism is of peace, triumph, victory, and eternal life. Today, they beckon you in a similar way. Palm trees suggest warmth and welcome you to their little slice of heaven for a while. Thank you for the transport to a place of palms! I could hear the typewriter sound and then again, at the end, I heard the welcoming. Fun – I have always lived in the northland so I just have not thought about the sound of palms. Thanks for that image.